Yipee, asparagus season is upon us! I really love love love asparagus. When I was growing up in Luxembourg, my mum would cook with asparagus every springtime. They were white asparagus, typically cooked with in northern Europe. She’d simply boil them and serve them with a creamy béchamel sauce and new potatoes. If there were any leftovers, she’d prepare a soup with them the next day. Since moving to the UK, I discovered the delights that green asparagus have to offer. They’re slightly different from their white sisters – more intense in flavour, more ‘green’, and slightly bitterer. Green asparagus are perfect for grilling – just throw some on a hot griddle pan or on a BBQ, and let them release a smoky, chargrilled flavour that’s just amazing. 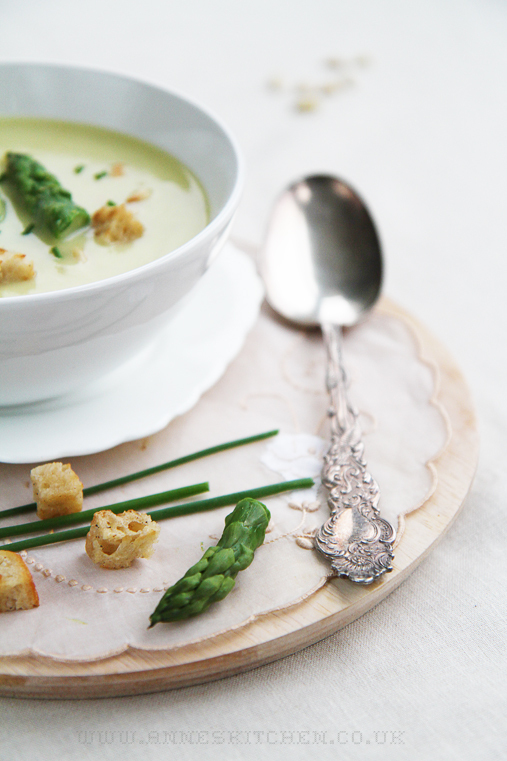 I still like the idea of making asparagus soup, so I decided to make one with green asparagus. I’ve added potatoes to create some texture, and made a few heavenly butter croutons to go with it. As always, there’s a dash of wine in my cooking (just adding a great dimension). If you prefer not to cook with wine, just substitute it for water or vegetable stock. A heavenly springtime dish – ideal for the cold weather spell we’re experiencing in the UK at the moment. 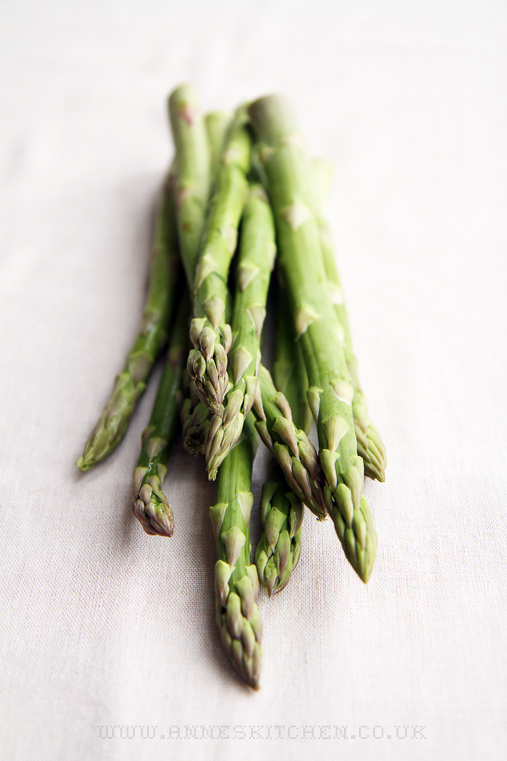 Wash the asparagus, cut around 4cm at the ends off and discard those hard ends. Cut the asparagus into 5 cm long slices. Peel the potatoes and cut into cubes (around 3cm cubes). Peel the onion, cut into cubes. Melt the butter in a pan and fry the onion for around 5 minutes, or until transluscent. Put a pot of boiling water on the hob. Add 2 tsp of course cooking salt. Boil the asparagus and potatoes for about 10 minutes. Fish out 8 asparagus spears with a slotted spoon, put into a colander and cool down under a tap of running cold water. They’ll be used as decoration later. Add the onion to the boiling potato and asparagus and keep cooking until the potatoes and asparagus are soft (about another 7 minutes). Drain the vegetable cooking water until it’s the same level as the vegetables. Puree the vegetables in the water with a hand blender. Now, pour the thick soup through a fine sieve, so that you get rid of the asparagus fibres. Put the sieved soup back on the hob, and add 100ml of white wine (or vegetable stock), season generously with salt and pepper and bring to a boil. Once the soup is boiling, turn off the heat, and add a tablespoon of crême fraîche. Keep warm while making the croutons. To make the croutons: cut the bread slices into little 1cm cubes. Melt 40g butter in a frying pan, add the bread cubes and fry until golden. Sprinkle with sea salt flakes and pepper. 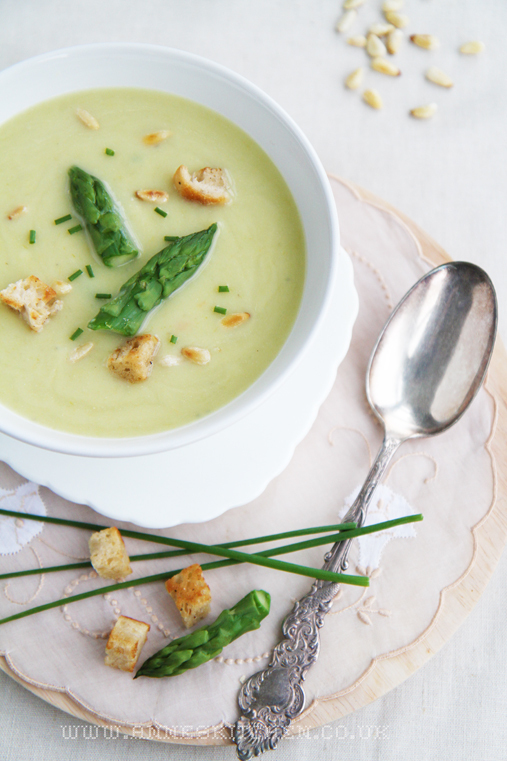 To serve, sprinkle some chopped chives, toasted pine nuts and croutons over your soup and enjoy. I think I’ll make this one night this week! Your pictures are so gorgeous. Thanks for the recipe! Cool, glad you like my photos and the recipe! Let me know how it goes!